The history of the Lake Champlain and St. Lawrence River Valleys is the history of the French farmers who settled the region. Tradesmen, trappers, and soldiers required a secure local food source that would allow them to pursue their interests, instead of spending all their time preparing, gathering, and hunting for food. Nearly 400 years ago, the Bouchers received several allotments in New France, which eventually became Quebec, Canada. They raised meat and work animals, grew crops, and made soap, butter, and flour – both for themselves and for sale. Wealth, respect, and additional land were the rewards for supporting the local community, but the risk was very high. Over the centuries many have abandoned farming, but a line of Bouchers remained in active agriculture. Today Boucher Family Farm is run by the families of Daniel and Denis Boucher. Family members perform all the daily operations on the 90-cow dairy, cropping 800 acres and maintaining over 200 acres of managed forest, which include deer yards and riparian corridors. For the past year, the Bouchers have shared the farm's facilities with another dairying couple; a partnership that may be unique in the state; two farmers, one dairy, lots of possibilities, and lots of beautiful and delicious cheese. 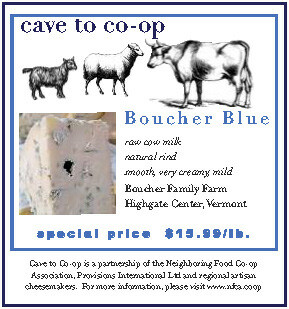 Based on a French Fourme d'Ambert, Boucher Blue is a true farmhouse cheese, unique to the Boucher family farm. The cheese is firm and smooth, very creamy, and mild. It carries the flavors of milk, earth and woods with undertones of chestnuts, sweet hay, and truffles. Boucher Blue is delicious as part of cheese plate and pairs well with sweet dessert wine. Its mild character and smooth flavor does not overpower as other, more classic blues can. Boucher Blue is an American Cheese Society award-winner. This being the season of holiday meals, here are some unique Boucher Blue variations on classic recipes for vegetable side dishes and one great old fashioned dip that works great as an appetizer while your guests are waiting for that turkey. Lay out mushrooms, rounded side down, cutting a tiny slice off that rounded side to help them balance on the baking sheet. In a medium mixing bowl, stir together the cream cheese, Boucher Blue, horseradish and milk. Add the garlic and bacon mixing well. Divide the cheese mixture evenly between the mushrooms and sprinkle with the bread crumbs. Bake in a 350˚ oven for 18-20 minutes or until tops are nicely browned. Rest the mushrooms 5 minutes before serving. Coat a baking sheet with olive oil. Toss the vegetables, olive oil, thyme, salt, and a few grinds of pepper right on the baking sheet. Spread vegetables into an even layer, cover with aluminum foil, and roast for 15 minutes. Uncover, toss the vegetables a bit, sprinkle with cheese, and roast for an additional 10-15 minutes, or until cheese is melted, and vegetables are browned and cooked to desired doneness. In a heavy medium saucepan over medium-high heat, warm the oil. Add the onion and sauté until golden brown, about 5 minutes. Add the mushrooms, sprinkle with salt and pepper, reduce the heat to medium, and cook, stirring frequently, until they begin to soften, about 3 minutes. Add the rice and stir until opaque, about 1 minute. Add the wine and stir until absorbed. Add about ¾ cup of the broth, and adjust the heat so the liquid bubbles and is absorbed slowly. Cook, stirring frequently, until the liquid is absorbed. Continue cooking, add the liquid about ¾ cup at a time and stirring frequently, until the rice is just tender but slightly firm in the center and the mixture is creamy, about 20 minutes. Mix in the Brussels sprouts, blue cheese and a generous amount of pepper. Taste and adjust the seasoning. Spoon the risotto into warmed shallow bowls or plates, sprinkle with walnuts, and serve immediately. Toss the onions in a baking dish with the thyme sprigs and just enough oil to coat. Season with salt and pepper. Roast for 15 minutes. Meanwhile, bring a pan of water to the boil. Add the sprouts and cook for 4 minutes. Drain, and then toss the sprouts with the onions. Roast for 15-20 minutes, until the sprouts are just starting to crisp up a little. Crumble over the blue cheese and sprinkle with the breadcrumbs. Roast for 10-15 minutes, until the breadcrumbs are golden. Toss potatoes with canola oil, ½ teaspoon salt, garlic powder and onion powder. Place two cooling racks on top of two cookie sheets. Lightly coat with canola oil. Place yams on cooling rack in one even layer, making sure they aren’t touching. If they are too close together they will steam instead of crisp up. Bake for about 10 minutes until the chips start to curl up on the edges. Watch carefully as they burn easily. Turn the oven off and let them sit there for 25-30 minutes. While the yams are cooking, make the blue cheese sauce. In a small skillet, melt butter over a medium heat, whisk in flour. Cook one minute. Turn the heat off and very slowly whisk in milk, making sure there are no lumps. Bring to a simmer, and cook until thickened 1-2 minutes. Crumble in half of the blue cheese. Whisk until incorporated. Season with salt and pepper. Set aside. Place half of chips on top, and drizzle with more blue cheese sauce. Sprinkle with bacon, green onions serving platter. Drizzle with some of the blue cheese sauce. Place other half of chips on top and then the remaining blue cheese. In the bowl of a stand mixer fitted with the paddle attachment, beat together the cream cheese, blue cheese, and buttermilk on medium speed until smooth and creamy. Add the dates, shallots, lemon zest, salt, and pepper and beat until well combined. Transfer the cheese mixture to a large sheet of plastic wrap and form it into a ball. Wrap and refrigerate until well chilled, at least 2 hours or overnight. In a shallow bowl, mix the parsley and walnuts. Remove the cheese ball from the refrigerator. Unwrap the cheese mixture and roll it gently in the nut mixture until all sides are well covered. Serve immediately or cover and refrigerate until ready to serve with crackers.